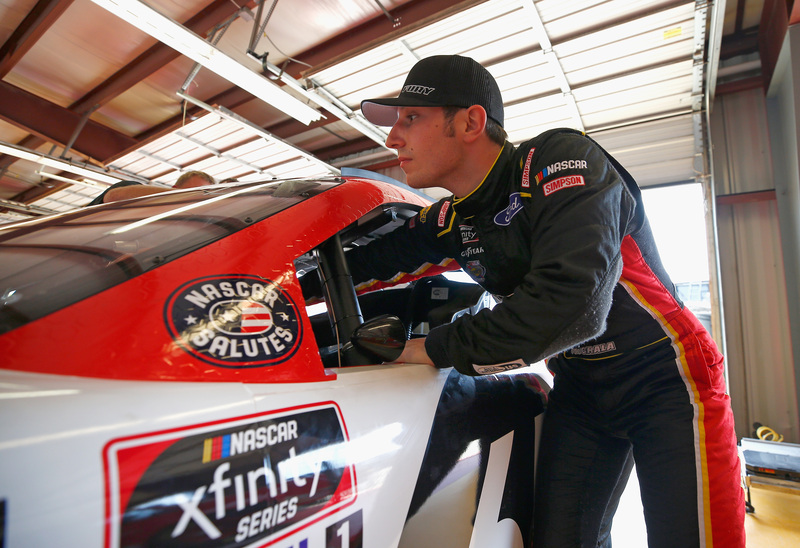 The 12 Questions series of interviews continues this week with Kaz Grala, the Xfinity Series driver who is now with Fury Race Cars after starting the year with JGL Racing. Grala’s playoff hopes recently came to an end after he missed the Kentucky race due to a lack of sponsorship, but the team is hoping to find funding for the rest of the season and beyond. I’m not much of a dreamer — literally. I don’t dream much. But I don’t think there’s ever a time I’m not thinking about racing. Even when I’m not racing, I’m doing it online like a total geek or something. So my whole life is racing. That’s all I’ve got. I feel like yes. If someone gets into me, especially if it looks intentional, I do appreciate an apology. It won’t fix anything, and I still probably owe them one, but I do appreciate the gesture. So I like to at least give people the satisfaction if it’s intentional. If it’s not, then they can deal with it. You said you still owe them one either way. So does it change the degree of how bad you owe them if they’ve apologized? Yes, I think the way you handle an incident afterward completely dictates what the ongoing trouble is between the two of you. I guess the biggest compliment someone could give me is just saying they respect the way I race. I try to race guys the way I would want to be raced, whether that’s from a contact perspective or just common courtesy on the racetrack. I think you have to race everyone as hard as you can, but everyone in the garage knows there are a certain number of things you can do that are just not cool to do to someone else, so I try to avoid those things. If someone says they enjoy racing around me, I take that as a good compliment. I’m a big fan of the Migos’ music, and I didn’t realize that they were at the race at California and I was pretty mad that I didn’t get to see them. I had no idea they were there until after the fact. So I wish I could get to meet them and lead them around. You love your meat and cheese? Yes. Vegetarian, maybe, because you can just overload on some pasta and some cheese — which you cannot deny is amazing. But if you’re taking cheese out of the equation, then it’s a no-go for me. 6. It’s time for the Random Race Challenge. I’ve picked a random race from your career and you have to tell me where you finished. This is the 2015 Loudon K&N race. Do you remember this at all? Yes. Started sixth, finished third? Started sixth, finished third! Wow. That’s pretty amazing. This is a race that William Byron dominated pretty much, but you were able to move up. So it was just a regular race in 2015. (Laughs) But I remember that one specifically because that was my home race, of course. I tend to remember the Loudon races. 7. Who is the best rapper alive? Oh wait, you just said you’re into rap with Migos. Yeah, we actually covered that, but another good one that I can give you is I’m a big 21 Savage fan. So you definitely like the new school guys. Yeah. I’m more of a new school guy in everything. Everyone’s into these old vintage cars, the old music. I can attest to the fact that I’m totally into the new stuff only. No matter what it’s about. This is always a good question to read the responses of on your website. The problem with this question is there is no politically correct answer, so I’m just going have to go with, of course, my good friend Justin Haley because I think he would do me the honor of giving me the answer to that question himself. He would like to punch you, so therefore you’ll just say him? Yeah, we just like to give each other crap back and forth. So he’s got it coming. So our spotter is probably Taylor Swift because she’s got a pretty good voice. Then what are the other jobs? Crew chief and motorhome driver between LeBron and Tom Hanks. OK, I’m going to go with LeBron as motorhome driver because I think it sounds like it would be pretty fun to hang out with him. And Tom Hanks is more of a serious guy. Like you’ve got to be serious to be the crew chief — you’ve got a job to do. So he’ll be the crew chief. That is important. You always have to eye out the closest port-o-potty or bathroom before driver intros because you have to make a stop there before the race. And some tracks do not make that easy for you. There’s been times I’ve missed the first word of the national anthem because I’m on my way back from the bathroom. But I wish tracks would make that easier for you. They need to put port-o-potties where they’re gonna grid the cars because anytime that there is a port-o-potty nearby, you’ll see five drivers lined up before opening ceremonies to be in it. It’s important. I did a interview with Denny Hamlin in the last 12 questions, and he was the first driver all year to go, “No, you don’t need port-o-potties, just go before you walk out to intros.” He didn’t understand why drivers need to wait until the last minute. Why does everybody wait? For me, at least at some races, the particularly hot ones, I hydrate like crazy for the three days before. So I may go before intros, but I’m going to need to go after intros still. It’s either that or in the car, and the car is not a pleasant time to do it, so I’m going to try to squeeze it in before I get into the car. Not that much, just the medical bills. I don’t think I’d survive it. I’m not coordinated, nor do I have any balance, so I don’t think it would go well. But hey, if they cover the medical expenses, I’d try it. 12. Each week, I ask a driver to give me a question for the next interview. Last week’s was with Denny Hamlin. He wanted to know: What’s the most disappointing loss you’ve ever had in your career? The most disappointing race for me was Pocono ARCA last year. Going into that race, I had never in my career started on the pole of a race and lost. And I qualified on the pole for the ARCA race there and led the first half of it. This was technically my second ARCA start, but my first was at Daytona so I’d like to say this was my first “regular” ARCA race. I was not aware of the restart rules — or lack thereof — and started on the front row with Justin Haley. He was well aware of them and we get within 100 yards of the box and he is gone and bringing guys with him, and I settled into fourth and was never able to climb my way back to the front and lost that race. He knows that I’m still bitter about that because every time I’m at his house, he makes sure to put that eagle trophy in a different spot right in front of me. This is the first 12 Questions with Kaz Grala. Thanks Jeff for including the little guy. I wish ALL the NASCAR media would include these guys/gals and their very underfunded teams in some of their write ups. It might help them get even the smallest of sponsors, maybe to help buy them a set of tires or whatever they could use. I have never been to a race but from what I understand there’s a lot of action that goes on mid-pack and back. Thanks for the interview of Kaz. Learning a little bit about him , now I am a fan. Wish I had the money to sponsor him and the the team. Good luck. One question I would consider asking is ‘Where is the location of the switch to activate the cockpit fire suppression system?’. A cup driver recently had a vehicle fire; the driver, when asked later about whether or not the he activated the cockpit fire extinguisher, seemed to indicate he was not sure of the location of the switch. The switch location was not germane to that particular situation, but I was surprised to hear a driver indicate any uncertainty of the switch location – that is one of the few things when you need it, you need it now, especially since activating the switch might be lifesaving. My guess is, if that driver had any uncertainty, then probably other drivers are uncertain, to especially include the younger/less experienced Nascar drivers. The intent of the question is not to embarrass anyone, but instead the intent is to prompt the the driver (and any other drivers who read this site) to review the switch location before the interview.